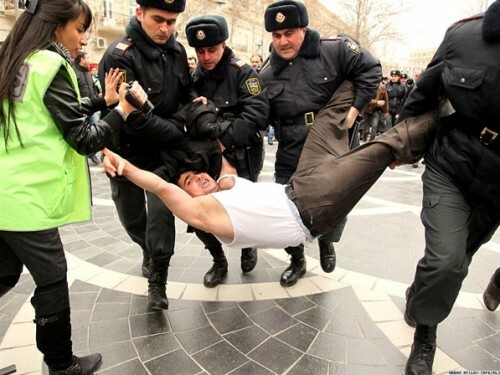 Following yesterday's protest by youth activists in Baku, the Azerbaijani capital, supporters of the opposition Musavat party today staged their own. Also inspired by pro-democracy protests in Egypt and Tunisia, the demonstration might not have been as large as those, with estimates ranging only from a few to a several hundred people, but it was certainly intense. There also wasn't as much online coverage on sites such as Facebook and Twitter, but what there was still managed to tell the story of a short-lived attempt to flout severe restrictions on freedom of assembly in the oil rich former Soviet republic. While the protest was underway and demonstrators were being arrested en masse, one Azerbaijani youth activist even noticed senior members of the ruling Yeni Azərbaycan Partiyası (New Azerbaijani Party) looking on from a nearby restaurant. However, numbering in their hundreds rather than thousands, protesters were no match for the police and no sooner had the demonstration begun than it ended less than two hours later. At that point, however, a number of live broadcasts from mobile showed journalists still at the scene even though protesters had left. Slowly, however, the situation seemed to get a little tense until the broadcast by youth activist and blogger @ilkin_alisoy unexpectedly stopped. Word eventually spread on Twitter that Alisoy had been detained along with others before confirmation came that he had been sent to court. Between 50 to 100 others were also detained according to different sources, and like several youth activists yesterday, Alisoy and at least one other were sentenced to 8 days detention. Ironically, however, judging from his own video streamed via Bambuser, Alisoy was not even part of the demonstration and was simply reporting on it alongside journalist friends and colleagues.